And who opposes it? Customers. With cable giant Comcast still hoping to receive a federal blessing for its bid to acquire Time-Warner Cable, currently its largest rival, the lobbying blitz is in full swing to sway lawmakers and federal regulators that the mega-merger will not, as critics charge, negatively impact consumers by further monopolizing an already highly-concentrated sector. Known for having one of the largest, most aggressive, and well-organized lobbying machines in Washington, DC, reporting from the New York Times on Monday indicates that in addition to direct influencing attempts, Comcast is relying on an army of outside organizations, trade organizations, community groups, and individuals to speak positively about the merger. The letters have come from all around the United States — from the Nutmeg Big Brothers and Big Sisters in Connecticut, the Houston Area Urban League and even the Dan Marino Foundation in Fort Lauderdale, Fla. — some praising theComcast Corporation, others urging the federal government to stand aside and approve Comcast’s proposed takeover of Time Warner Cable. Ultimately the merger will have to receive approval from the Federal Communications Commission, but opponents to the further concentration of Comcast’s market share have been running a successful campaign against the deal by leaning on the people who so far seem to be voicing the most reasonable objections: cable consumers themselves. As it turns out, widely-shared experiences of inadequate service and a history of customer complaints have been winning the argument, pushed by Comcast and Time-Warner, that bigger would mean better. 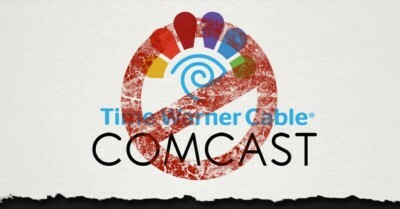 Meanwhile, opponents of the merger, like the consumer advocacy group Free Press, have been consistently able to show that while the money may be on Comcast’s side, simple messaging—including op-eds with titles like “Horrible, Evil, Terrible Comcast“—continue to receive the backing of millions of cable users from across the nation who don’t want to see the two largest cable companies join forces.